Electronics are used in a wide range of applications including computing, communication, biomedical, automotive, military and aerospace. They must operate in varying temperature and humidity environments including indoor controlled conditions and outdoor climate changes. Moisture, ionic contamination, heat, radiation and mechanical stresses are all highly detrimental to electronic devices and can lead to device failures. Therefore, it is essential that the electronic devices be packaged for protection from their intended environments, as well as to provide handling, assembly, electrical and thermal considerations. Currently, more than 99% of microelectronic devices are plastic encapsulated. Improvements in encapsulant materials, and cost incentives have stretched the application boundaries for plastic electronic packages. Many electronic applications that traditionally used hermetic packages such as military are now using commercial-off-the-shelf (COTS) plastic packages. Plastic encapsulation has the advantages of low cost, smaller form factors, and improved manufacturability. With recent trends in environmental awareness, new environmentally friendly or ' green' encapsulant materials (i.e. without brominated additives) have emerged. Plastic packages are also being considered for use in extreme high and low temperature electronics. 3-D packaging and wafer-level-packaging (WLP) require unique encapsulation techniques. Encapsulant materials are also being developed for micro-electro-mechanical systems (MEMS), bio-MEMS, bio-electronics, and organic light-emitting diodes (O-LEDs). 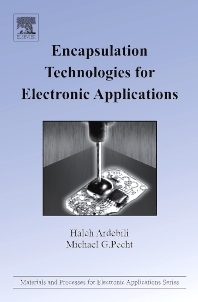 This book offers a comprehensive discussion of encapsulants in electronic applications. The main emphasis is on the encapsulation of microelectronic devices; however, the encapsulation of connectors and transformers is also addressed. This book discusses 2-D and 3-D packaging and encapsulation, encapsulation materials including environmentally friendly 'green' encapsulants, and the properties and characterization of encapsulants. Furthermore, this book provides an extensive discussion on defects and failures related to encapsulation, how to analyze such defects and failures, and how to apply quality assurance and qualification process for encapsulated packages. This book also provides information on the trends and challenges of encapsulation and microelectronic packages including application of nanotechnology.